TruthWinsOut.org expressed concern today over a Reuters news story about a drug-resistant strain of MRSA bacteria that is more prevalent among gay men in urban centers, such as Boston and San Francisco. The organization also slammed extremist groups for exploiting the news in order to smear the GLBT community and advance an agenda of pure prejudice and discrimination. Matt Barber, policy director for cultural issues with Concerned Women for America, used the news to viciously attack gay people. “Citizens, especially parents, need to stand up and say, ‘No More! We will no longer sit idly by while politically correct cultural elites endanger our children and larger communities through propagandist promotion of this demonstrably deadly lifestyle,'” Barber said. TruthWinsOut.org urges all people to educate themselves and take necessary precautions, if needed. 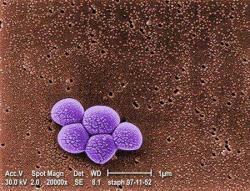 According to the Centers of Disease Control and Prevention, MRSA killed 19,000 Americans in 2005.